The question of how Native American tribes might “fit in” to the newly-formed United States had been on the minds of US political leaders since its infancy. 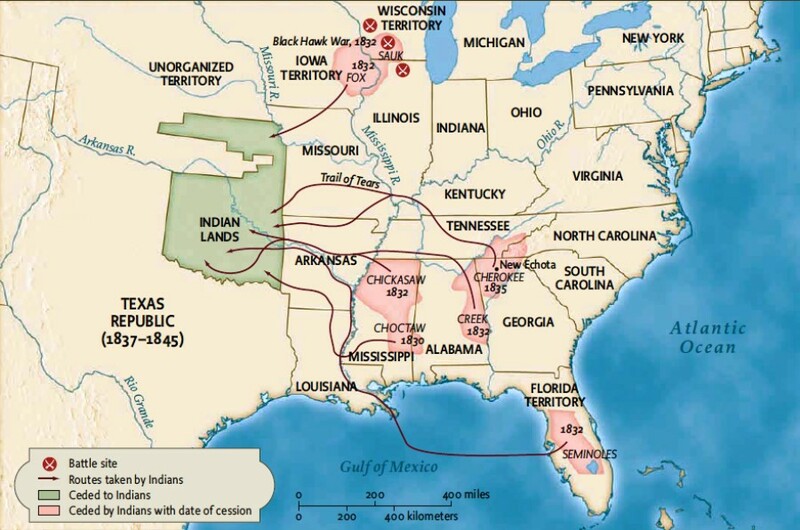 Up until Andrew Jackson’s presidency, it was Thomas Jefferson’s view–that, as long as these tribes assimilated or became “civilized”, they would be permitted to remain east of the Mississippi River–reigned supreme. In 1830, however, Jackson adopted a much harsher stance and primarily forced the big five “civilized” tribes that had all resided east of the Mississippi for thousands of years–the Chocktaw, Chickasaw, Cherokee, Creek and Seminole–west of the Mississippi River in his genocidal and jingoistic Indian Removal Act. Over 25,000 Native Americans died as a result.